You are a newcomer to Canada and you get invited to a potluck. What is it? What is expected of you? Part of learning English is learning how to adapt to a different culture. Potluck is a wonderful tradition here in Canada! It is a popular, relaxed way to host a group meal. 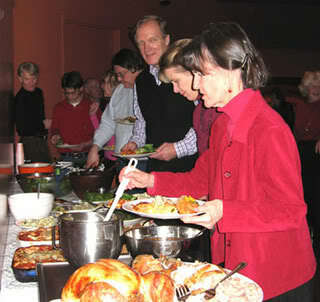 Sometimes a group of neighbours, a church, or a business will have a potluck. Each person (or family) contributes food for the group, with the idea that the combined dishes will provide a complete meal (i.e., hot dishes, salads and desserts). The food is typically arranged on long tables, buffet style. The guests serve themselves, seat informally, and visit while they eat. Traditionally, the food at a potluck is left to chance, or “luck”. If everyone brings the same dish, then that’s the way it is! I once went to a potluck in the summer where most of the guests had brought potato salad! You may be invited to a potluck where the host, or coordinator, asks you to bring something specific (e.g., a hot dish and buns), ensuring that there will be a variety of food at the meal. We were recently invited to a potluck where seafood was specially purchased from the Maritimes. The guests all contributed money to pay for the fresh seafood and they brought potluck salads and desserts. I love an international potluck, where everyone brings a traditional dish from their home country! Do I take drinks, or just food? Typically, the host provides a non-alcoholic cold beverage, plus tea and coffee. Depending on the setting, you even be asked to bring your own beverages, as well as your own cutlery, plates, etc. If the potluck is outdoors and there are no dishes available, the host may tell you to bring your own dishes. That way one person doesn’t have to supply cutlery, plates, dishes and napkins for the whole group. How much food should I take to a potluck? If you are invited to a potluck, you should take enough food to feed your group/family, plus a little extra for unplanned guests. If you haven’t already been to a potluck, I hope you have the opportunity. Potluck is a great chance to try new dishes, get some new recipes, and enjoy visiting with both new and familiar friends!